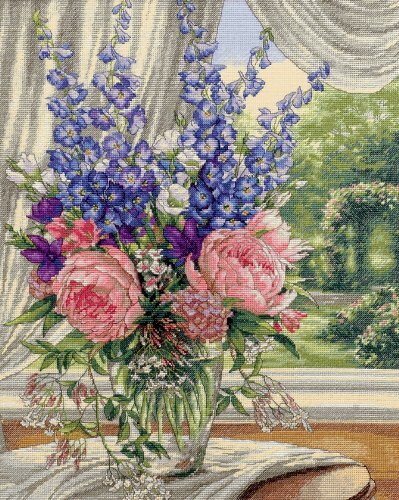 Dimensions 'Peonies and Delphiniums' Floral Counted Cross Stitch Kit, 18 Count White Aida, 12" x 15"
Floral cross stitch kit includes 18 count white Aida, presorted cotton thread, needle, and easy to follow instructions. Completed Peonies and Delphiniums floral cross stitch pattern measures 12'' x 15''. This intricate cross stitch pattern features a lovely bouquet of peonies and delphiniums perched on a table overlooking a garden. This advanced cross stitch kit is sure to be a fun and rewarding challenge for experienced needle crafters! Frame and hang your completed floral cross stitch project for a stunning piece of DIY wall art! Dimensions 'Paris Market' Counted Cross Stitch Kit, 18 Count Ivory Aida, 15" x 11"
Dimensions Beautiful Ballerina Counted Cross Stitch Kit, White 18 Count Aida Cloth, 14" x 14"